Having a comfortable and shaded area in your garden and other outdoor space is easy as long as you have a shade sail available to be installed. Shade sails are a very effective weather shield to protect people from harmful sunlight and rain. People who have shade sails installed outside will always have a place to relax, keep your car cool even if the sun is very bright or when it rains. Thanks to shade sails, you can enjoy the outdoors regardless of the weather. Shade sails are very affordable. In fact, many people buy only a few of them to make sure their outer space useful in any weather. Shade sails is not overly expensive but very durable. You can rely on it, even if the weather is hot or rainy. We have a water resistant range, so they can withstand heavy rain and wind. You can purchase a larger one to provide more shading and protection space. In addition to weather protectors, shade sails can add appeal to your home. Some are installed to make sure that their home will look attractive and fun. All our shade sails are designed with appeal in mind. This can be achieved by our colour range but mainly from our designs that simply work! It is currently used by many companies to make their place look attractive and comfortable to clients or customers. Even from afar people will certainly notice the beautiful colours and patterns of these sails. They can also be placed in homes where they will add magic and attractiveness to the home. The ultraviolet rays of the sun, which put you at risk of cancer, can actually be blocked by shade structures. You can get protection from sunlight and rain because the materials used in shades of high quality and water resistant factors are effective. Different brands offer many options when it comes to the structure of the sail shadow. You can choose a sail shade that fits your pocket. Many colors, patterns, fabrics, textures, and patterns of sails are enough to make you confused! The Shade Sail offers not the only comfort from the sun, but also ideal for swimming pools and gardens. These shades are elegant and give each space a different and contemporary personality. You can clean these sails with ease. Many people create interesting themes using shade shading, using different designs and sizes of sails at different levels. The vast majority of shade sails are in the form of a triangle, square or rectangle because the angles allow you to pull out the sheath. Select the shape that best fits the area. If your space is unique and difficult to call us to speak to an expert. Shade sails come in a wide range of colours. Choose a color that complements the space. Bright colours are ideal for a lively space or playgrounds. White and beige raise modern and elegant aesthetics. We only use the range from Rainbow shade as its the best. We won’t offer you a cheaper alternative because we stand behind our work and want to achieve the best outcome and longevity from you shade sails. Our corners are reinforced, stitched 5 times and are backed by our 10 year warrantee. Low quality sails will wear and will collect dirt much faster than the high-quality sail. With many benefits, it is not surprising that the Shade Sails Gold Coast are now very popular. Put it in your garden and you will be able to enjoy the tranquility, privacy, and elegance that you will bring. 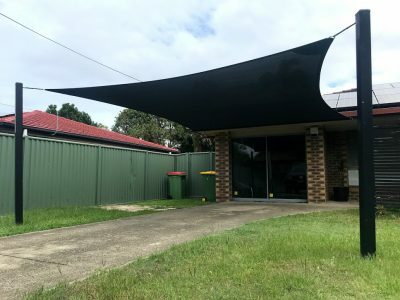 They will not break the bank because the prices are very reasonable, so install Shade Sails Nerang and see how much it changes to outer space.